An apple a day keeps the doctor away. I’m sure you’ve heard this before. And while there are many ways in which we could keep the doctor at bay with an apple (target practice anyone? ), our wellbeing demands we eat the luscious fruit. Truthfully, the old adage could not be truer for a variety of reasons. So to keep things organized I am going to worm through the benefits of apples categorically. Also remember we are dealing with the apple fruit, not the apple fritter or apple flavored candy or the iPhone. I suppose the best starting point is the apple’s nutritional worth. As you can see in the nutritional label to the right, a single medium apple is less than 100 Calories and provides over 10% of the RDA for fiber. Apples also contain every vitamin needed by the body with the exception of Vitamin B12, which is only found in animal products, and Vitamin D, which you can produce by eating your apple under the sun. The same applies to minerals, with apples providing a little of everything except selenium. If you have ever looked at an apple you may have noticed it resembles the humble heart, and for good reason. A comprehensive review of nine human studies conducted by researchers at the British Nutrition Foundation in London examined the effects of apples on cardiovascular disease risk factors and found that apple polyphenols, a type of antioxidant, have a positive influence on blood lipids and blood pressure in human beings (Weichselbaum, Wyness and Stanner 2010). Furthermore, don’t think that apple juice has you covered, since these compounds are most concentrated in the peel of the apple (Wolfe, Wu and Liu 2003). In fact, whole apples have an average of 57 times more polyphenols than commercial apple juice (Hyson 2011; cf. Figure 1). Not for juicers (addendum by Adel)! I won't tire and repeat it once again. If you want to eat fruit, do so - EAT it, don't juice it, or buy juices from the supermarket. Why? Just take a look at the phenol loss in juices in Figure 1 and you have your answer. Okay, so heart health is from the antioxidants in apples and I can get those in any fruit or vegetable. Well, not quite. In one study of nonsmoking healthy middle-age adults who ate apples less than twice a month, simply eating one apple per day lowered blood levels of oxidized LDL – a substance linked to hardening of the arteries – by 40% (Ohio State University 2012). And it’s not just because of the polyphenols either, since a group in this study that took a polyphenol supplement instead of eating the apple had similar but not as pronounced effects. Even dried apples show promise, with a separate study concluding that daily dried apple consumption “can significantly lower atherogenic cholesterol levels” (Chai, et al. 2012). The only caveat is that you need to eat the equivalent of two apples per day if dried rather than fresh. In a very recent study, researchers from the University of Navarra in Spain sought to determine the mechanisms through which the beneficial effects of apple polyphenols act on diet-induced obesity (Boqué, et al. 2013). Overall, they found that apple polyphenols exerted potent anti-obesity and anti-diabetic effects through prevention of fat cell growth, decreased intestinal glucose uptake, and increased fat breakdown. These effects were observed at both the surface and genetic level. The researchers even conclude their study with the acknowledgement that apple polyphenols can act “as a promising functional food ingredient for the management of obesity and its metabolic complications”. A review summarizing the current knowledge on potential cancer preventive effects of apples conducted by a lone researcher at the German Cancer Research Center in Germany found that apples influence multiple mechanisms relevant for cancer prevention on the genetic level, and regular consumption of one (or more) apple per day has been shown to prevent skin, breast, and colon cancer (Gerhauser 2008). And it all comes back to the whole fruit, with some of the most potent anti-cancer compounds residing in the peel (Cornell University 2007). Apples can do even more! The antioxidants in apples have been shown to extend the average lifespan of fruit flies by 10% (American Chemical Society 2011). Granted the relevance to humans is debatable, but it’s interesting nonetheless. Apple polyphenols may even provide protection against some autoimmune diseases such as ulcerative colitis and Crohn’s disease (Federation of American Societies for Experimental Biology 2011). Another unique compound found in apple peels, ursolic acid, prevents muscle loss during illness and aging, and “animals given ursolic acid also became leaner and had lower blood levels of glucose, cholesterol and triglycerides” (Cell Press 2011). And it doesn’t end there. In a review and analysis of apples and related compounds, Dianne Hyson (Hyson 2011) from the Department of Family and Consumer Sciences, California State University concluded that, There are current data suggesting that [apple polyphenols] might be linked to reduced risk of several forms of cancer, cardiovascular disease, and asthma. [Apple polyphenols] may also have beneficial effects on outcomes related to Alzheimer’s disease, cognitive decline of normal aging, diabetes, weight management, bone health, and gastrointestinal protection from drug injury. Red Delicious is king, when it comes to its antioxidant power. Talk about natural medicine! While everyone has their own apple preferences, some of us may want to know how to capitalize on this apple investment. If that’s the case, then I present the Red Delicious apple. Studying the antioxidant amounts of every apple variety would be difficult, but less broad comparisons have been done. One of these studies looked at eight popular apple varieties grown on the same farm under similar conditions and found that the Red Delicious had the most antioxidant activity (American Chemical Society 2005). Oh, and before I forget. Apples are harvested in the fall, which makes local organic difficult to find during other times of the year. Usually, a bunch of apples will be picked and stored through the winter until the next harvest. Fret not, since “long-term storage, both at refrigerator temperature and under controlled atmosphere conditions, was found not to influence flavonoid concentration or antioxidant activity” (van der Sluis, et al. 2001) of the apple. Have your head in the clouds from choosing to eat that apple with lunch? I’m not surprised, given that recent research has shown that eating fruit and vegetables may promote emotional wellbeing (White, Horwath and Conner 2013). More specifically, “on days when people ate more fruits and vegetables, they reported feeling calmer, happier and more energetic than they normally did" (IANS 2013). Even just eating apples in everyday life has been shown to reduce hunger and elevate mood (Macht and Dettmer 2006). Eating more apples isn’t challenging either. Actually, it’s as simple as buying a new fruit bowl. People are more likely to eat apples when they are visible and easily accessible (Privitera and Creary 2012). So keep your fruits close, and your apples closer. Especially during stressful times, as you may find yourself a little less anxious (Hyson 2011). Promise me! Never throw away the pomace, if you insist on juicing your apples, then keep the pomace in whatever the result may be. This is where all the good stuff is and this is what made the difference between a 5% reduction in type II diabetes risk for apple eaters and a 8% increase in type II diabetes risk for apple (and other) juice drinkers in a recent analysis of three prospective longitudinal cohort studies by Muraki et al. (2013). Bottom line (by Adel): If you are not convinced of the benefits of apples (not Apple! ), yet, you may want to have a parting look at a study that made a direct comparison between statins and apples with respect to their cardio- and stroke-protective effects in otherwise healthy adults over 50 years. The results of the model the scientists fed with data from previous studies are quite astonishing: With a assumed compliance of 70% compliance in the "an apple a day" arm of the study, the scientists except a reduction in vascular mortality of 12%. Now, allegedly that's based on the estimate that this would be the necessary consequence of the "apple-induced" reduction in low density lipoprotein... but alas, it's better than the hilarious and obviously 100% irrelevant witch-hunt on apples and other "high fructose fruit items" *rofl* - I mean, I find it "lustig" (German word for "funny") that people believe that someone would develop diabetes & NAFLD from eating whole apples. American Chemical Society. Eating apples extends lifespan of test animals by 10 percent. March 8, 2011. http://www.sciencedaily.com/releases/2011/03/110302121702.htm (accessed May 13, 2013). —. Red Delicious, Northern Spy Apples Have Most Antioxidants, Chemists Find. May 23, 2005. http://www.sciencedaily.com/releases/2005/05/050523234141.htm (accessed May 16, 2013). Boqué, Noemi, et al. "Prevention of diet-induced obesity by apple polyphenols in Wistar rats through regulation of adipocyte gene expression and DNA methylation patterns." Molecular Nutrition & Food Research, 2013: [ePub ahead of print]. Cell Press. Apple Ingredient Keeps Muscles Strong: Component of Apple Peels Found to Help Prevent Muscle Weakening in Mice. June 7, 2011. http://www.sciencedaily.com/releases/2011/06/110607131718.htm (accessed May 13, 2013). Chai, S C, S Hooshmand, R L Saadat, M E Payton, K Brummel-Smith, and B H Arjmandi. "Daily apple versus dried plum: impact on cardiovascular disease risk factors in postmenopausal women." J Acad Nutr Diet 112, no. 8 (2012): 1158-1168. Cornell University. An Apple Peel A Day Might Keep Cancer At Bay. June 3, 2007. http://www.sciencedaily.com/releases/2007/06/070601181005.htm (accessed May 13, 2013). Federation of American Societies for Experimental Biology. Scientists discover anti-inflammatory polyphenols in apple peels. December 15, 2011. http://www.sciencedaily.com/releases/2011/11/111130100455.htm (accessed May 13, 2013). Gerhauser, Clarissa. "Cancer Chemopreventive Potential of Apples, Apple Juice, and Apple Components." Planta Medica 74, no. 13 (2008): 1608-1624. Hyson, Dianne A. "A Comprehensive Review of Apples and Apple Components and Their Relationship to Human Health." Advances in Nutrition 2, no. 5 (2011): 408-420. IANS. Eating fruits, vegetables linked to emotional well being. January 30, 2013. http://cooks.ndtv.com/article/show/eating-fruits-vegetables-linked-to-emotional-well-being-321793 (accessed May 16, 2013). Macht, M, and D Dettmer. "Everyday mood and emotions after eating a chocolate bar or an apple." Appetite 46, no. 3 (2006): 332-336. Markowski, J., W. Plocharski, and M. Mieszczakowska. 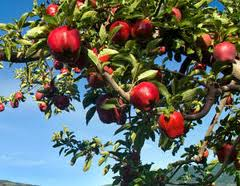 "Effect of cultivar and processing on phenolics and antioxidant activity of apple products." I International Symposium on Human Health Effects of Fruits and Vegetables 744. 2005. Muraki, Isao, et al. "Fruit consumption and risk of type 2 diabetes: results from three prospective longitudinal cohort studies." BMJ: British Medical Journal 347 (2013). Nutritional Info: Raw Apple with skin. 2013. http://skipthepie.org/fruits-and-fruit-juices/apples-raw-with-skin/?weight=182 (accessed May 2, 2013). Ohio State University. An apple a day lowers level of blood chemical linked to hardening of the arteries, research suggests. October 2, 2012. http://www.sciencedaily.com/releases/2012/10/121002143220.htm (accessed May 13, 2013). Privitera, G J, and H E Creary. "Proximity and Visibility of Fruits and Vegetables Influence Intake in a Kitchen Setting Among College Students." Environment and Behavior, 2012. Stracke, B A, C E Rüfer, F P Weibel, A Bub, and B Watzl. "Three-year comparison of the polyphenol contents and antioxidant capacities in organically and conventionally produced apples ( Malus domestica Bork. Cultivar 'Golden Delicious')." J Agric Food Chem 57, no. 11 (2009): 4598-4605. U.S. Department of Agriculture. "USDA National Nutrient Database for Standard Reference, Release 26." 2013.
van der Sluis, A A, M Dekker, A de Jager, and W M Jongen. "Activity and concentration of polyphenolic antioxidants in apple: effect of cultivar, harvest year, and storage conditions." J Agric Food Chem 49, no. 8 (2001): 3606-3613. Weichselbaum, E, L Wyness, and S Stanner. "Apple polyphenols and cardiovascular disease – a review of the evidence." Nutrition Bulletin 35, no. 2 (2010): 92-101. White, Bonnie A, Caroline C Horwath, and Tamlin S Conner. "Many apples a day keep the blues away – Daily experiences of negative and positive affect and food consumption in young adults." British Journal of Health Psychology, January 2013. Wolfe, Kelly, Xianzhong Wu, and Rui Hai Liu. "Antioxidant Activity of Apple Peels." J. Agric. Food Chem 51, no. 3 (2003): 609-614.